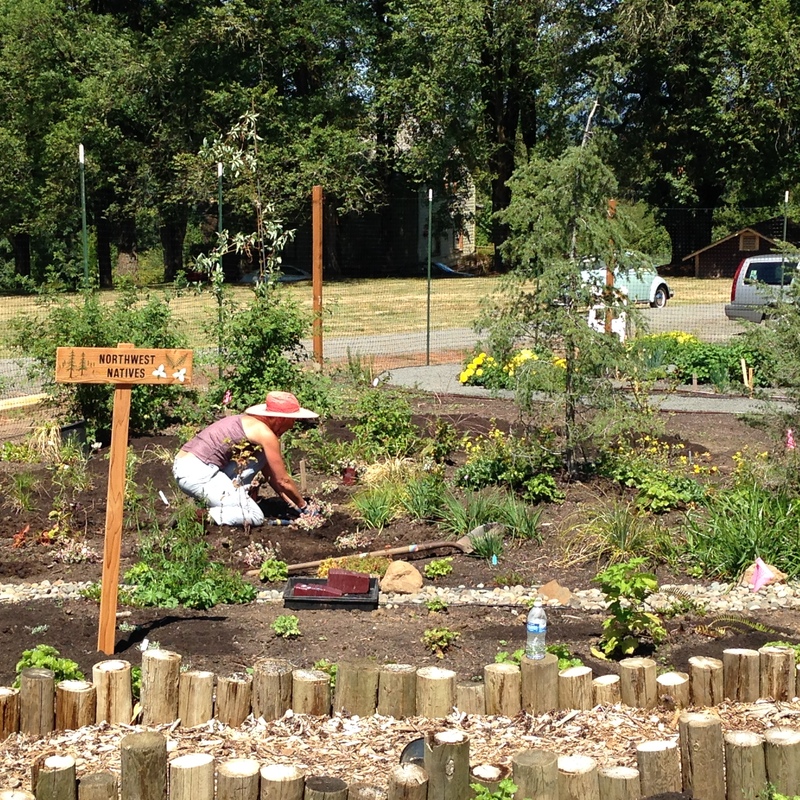 The Learning Garden at Jenkins Estate in Beaverton has work hours EVERY Thursday from 10:00am to 1:00pm near the Gate House. The public is also welcome to visit the garden during any hours that Jenkins Estate is open. Jenkins Estate is at 8005 SW Grabhorn Rd, Beaverton, OR 97007 Map . Seminars are offered for free and open to the public throughout the year with our In the Garden Series. The Learning Garden offers hands-on opportunities to explore a wide range of sustainable gardening practices using several garden themes including-Vegetable Gardening, Waterwise Garden, Pollinator Habitat, A Bioswale, Spiral Herb Garden, Native Plants documented in the Lewis and Clark Expedition, Perennial Companion Plants, Espalier Fruit Trees, Edible Landscape, Berries, Grapes and other fruit. Garden-goers can also learn at our Composting Demonstration area and learn about creating Mason Bee habitat. We welcome groups for guided tours of the WCMGA Learning Garden with suggested tour times on Thursdays between 10 AM- 1 PM. 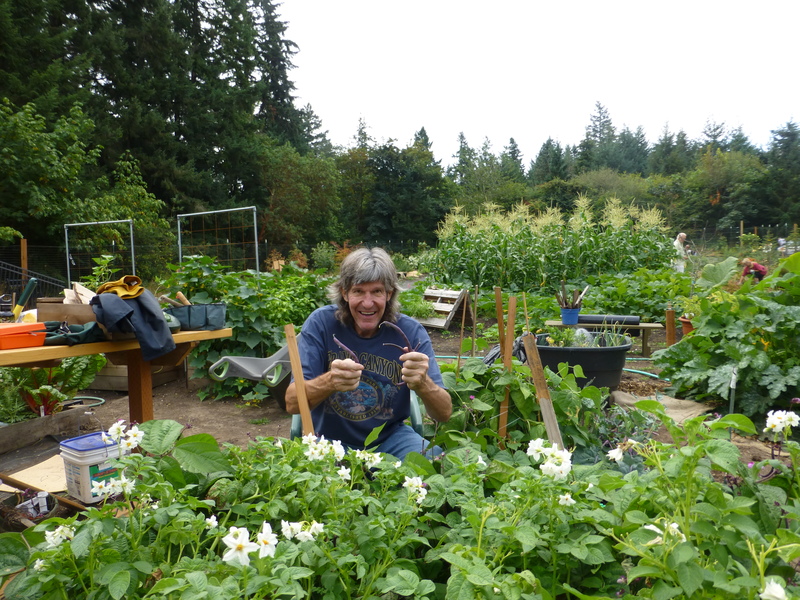 If you are interested in scheduling a tour lead by a Master Gardener, please contact Sandy Japely at sjapely@gmail.com. The public is also welcome to visit the garden anytime. We are located near the Gate House. Let’s tour our way through the many gardens that are featured in the Learning Garden at Jenkins Estate. The Pollinator Garden is designed to have pollinator attractants in bloom year round. Jenkins Estate already has pear and apple trees near the Learning Garden that help with early spring blossoms. The WCMGA Learning Garden volunteers have added mahonias, a cherry tree, pieris japonica, lavender, heath and heathers to ensure we have lots of enticements for the pollinators. 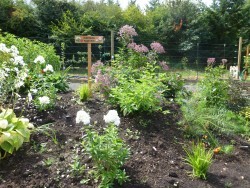 Flowers have been planted in extra large clumps to help attract the pollinators. The mason bee stations were one of the first things to go in at the Learning Garden. Ron Spendal installed 3 stations, starting with 450 cocoons in early March 2014. The bees were active from March 24 through early June; ultimately developing 1,152 nesting cells. Ron Spendal is our incredibly talented bee expert in Washington County. He tracks mason bee nesting stations in about ten sites throughout the tri-county area and reports his results to the university. His recommendation of the best resource on mason bees is a SARE published book entitled How to Manage the Blue Orchard Bee – As an Orchard Pollinator. The Waterwise and Dry Garden will appeal to anyone who wants a low-maintenance and ecologically-sound, low-water use garden. This garden was developed to house plants that thrive in a Mediterranean style climate – mild, wet winters and warm, dry summers. Sounds a little like parts of the Pacific Northwest, no? Though the garden ultimately is low maintenance, it does require careful assessment of soil, drainage, light and moisture. Key to a successful waterwise garden, according to Joy Creek Nursery and others is adding a layer of ¼” ten gravel. It lightens the soil, assists drainage and as an added bonus you get a lot fewer weeds. Carolyn Adams has remarked, often with glee, that the waterwise area is an area that doesn’t need a lot of weeding. One of the really eye catching plants that is showcased in the Waterwise area is the Bouteloua Gracilus.It is a gorgeous native grass with chartreuse flowers that bloom in mid-summer but the seed heads stay in place through the fall and winter and really keep putting on a great show for months. 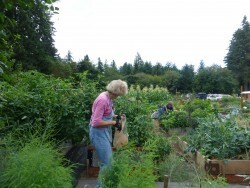 The busiest section of the garden is the Vegetable Garden Area. There is constant planting, harvesting, and weeding going on. The Raised Bed Vegetable Garden area has more than a dozen ideas on how to construct a raised bed, to really get a gardener thinking there really are not limits to creativity when it comes to creating a raised bed. Regardless of cost, there’s a raised bed design for you in the Jenkins garden. Plants are thriving in the simplest of raised beds –just a mounded soil bed two feet wide — Requires no money, just a shovel and some time to mound up the soil. Very inexpensive quick corner raised bed – just slide standard cut lumber into 4 steel corners, no tools required. Concrete blocks make good raised beds too. They are easy to build, though a bit heavy, so you may want to have your teenage friends help with the assembly. Just add soil and plant You can add rebar and gravel as a reinforcement. Colorful interlocking Lego Block raised bed. You can change the shape and height just by removing portion of the inerlocking blocks. These are made by a local company, Togetherfarm, here in Portland. Keyhole design lets the gardener stand in one place and be able to reach to work in every section of the garden. Plus the keyhole design is visually appealing. 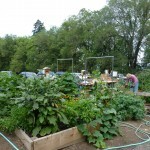 Intensive gardening, or Square foot gardening, as one author calls it, is really a good way to have a weed-free garden, and do it all in a very SMALL space. This is a 4 foot by foot bed that allows for 16 1 foot square sections for planting. A simple circular wall bed. You can make it as big or as small as you’d like, the kits come in sections you can add or subtract. If your soil is poor or you want to use the raised bed method but are short on soil, you may want to consider growing your crops in hay. When you are done using the bales, compost them for more soil for another gardening year. Stock Tank provides a great elevated planting surface, protects plants form pests, is easily moveable around the garden to wherever you want to move it. Besides the raised beds, there are plenty of examples of how to do vertical gardening at the Learning Garden. In addition, olive trees are thriving at the Learning Garden. They were donated by Red Ridge Farms and were the very first plants to go in the garden. The Native Plants Garden features a really nice log-bordered trail, a stone river, conifers on a berm, and lots of beautiful flowering natives on the garden floor. One of the goals of the Learning Garden is to provide some interesting history for children and adults. So the Native Garden area features many of the plants Lewis and Clark came across on their voyage of discovery in the early 1800s. 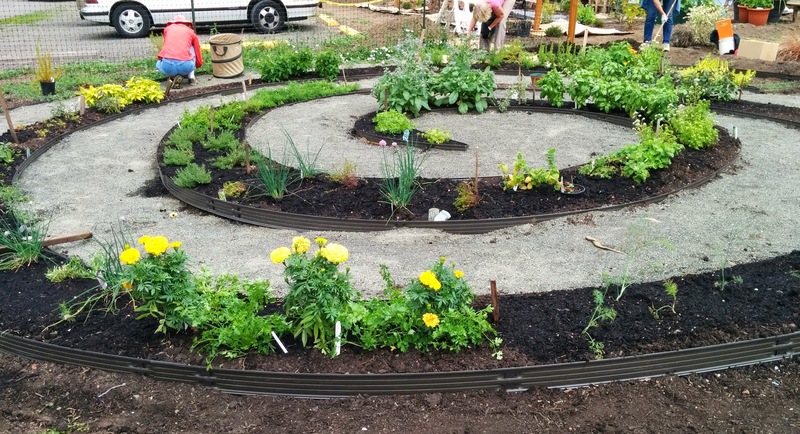 The Spiral Herb Garden is a visually pleasing and fun way to grow herbs. The paths are 3 feet wide with 2 foot beds to enable you to see every herb really up close and still around you room to move around easily. Several different varieties of species are planted in the spiral – several different types of basil that attract bees, english thyme and lemon thyme; several different types of oregano, including a gorgeous golden oregano. One of the additions to the garden as a whole next year will be beds devoted to ethnic cooking herbs and foods. So as an example we plan on putting in a bed associated with Latin cooking, and East Indian/Thai cooking. If you have other ideas, let us know, we’d love to have you join us in the garden and create a culinary masterpiece. 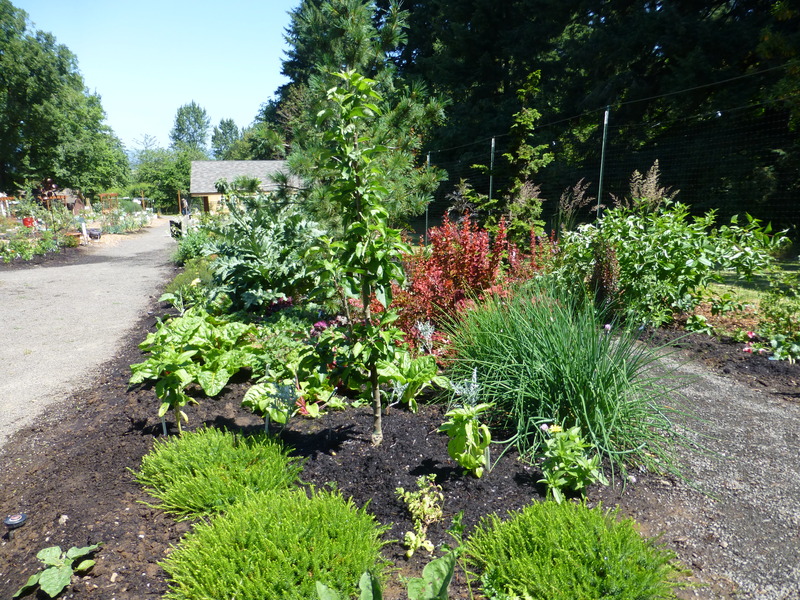 The Companion Planting Garden, showcases perennials in complementary combinations. The original topography of the area was relatively flat and fully sunny. To make the area more interesting, we created a 4 foot high berm with a Japanese maple and other plants on top that have created a change in elevation to showcase plants at different levels and create shade on the north side. The north side of the berm is shady enough for lots of shade loving plants to thrive – hydrangeas, hostas, daphne odora, even bleeding hearts. The berm features two gorgeous plants – on one side is Joe Pye Weed -named for a Massachusetts Indian who used the tea to treat typhus in early 1800’s. The other bookend showstopper plant on the South sunny side of the berm is the Lemon Drop Helianthus. It is spectacular all summer long and into October with 2” sunflowers and a whopping 8 foot high canopy. In the fully sunny Southwest corner of the Companion Planting area, lives a Limelight Hydrangea, a hydrangea paniculata that loves sun. It is different from the more common hydrangea macrophylla that should be pruned in the fall, best pruning time for it is in the spring. A couple of favorite resource books for Companion planting, mixing the right colors, heights, of perennials, attracting pollinators, and ensuring year-round interest are The American Horticultral Society’s Encyclopedia of Gardening and Tracy DiSabato-Ast’s The Well-Tended Perennial Garden. In addition, Fine Gardening magazine and the great plant picks website are great sources with beautiful photographs and great ideas on having success with perennials. You can’t have a good garden with good soil, so the a visit to the Compost Demonstration Area at the Learning Garden is a great place to learn about composting. The Learning Garden composts our own plant debris on site with the Compost Demonstation Area serving as a resource for various ways to compost. Any weeds, diseased or pest ridden plants go off site and are sent to trash collection. Cuttings, old vegetable plants and other greens are chopped up and composted on site. Dry leaves/straw bales are added to keep green and brown additions in balance. An optimal pile of compost is 3 to 5 feet by 3 to 5 feet with good airflow. If it stinks, you don’t have enough oxygen getting in there to feed the oxygen loving microbes. 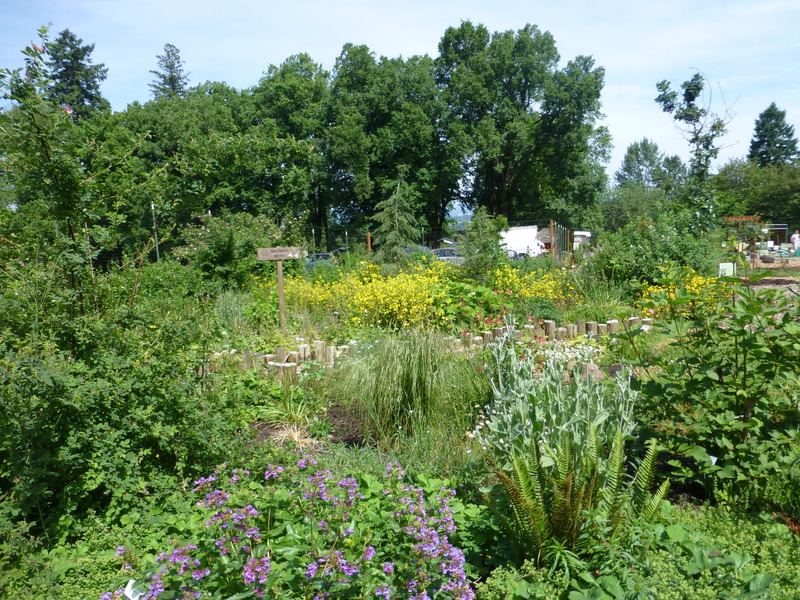 The Urban Edibles Garden of the Learning Garden shows the home gardener how to mix ornamental plants with edible plants to optimize small residential spaces. Spirea Magic Carpet, black mondo grass, heuchera, barberry, and sky pencil ilex provide layering of perennial plants, some of them evergreen. Lingonberry, black currant, columnar apples, plum, table grapes and a combination peach tree multi-task as landscape and edible plants. Seasonal vegetables and herbs add interest and add to the list of edibles incorporated into the landscape. Good garden design principles are used throughout the entire Learning Garden, but here in the Urban Edibles, since it is a long and narrow area, evergreen conifers were specifically selected for their narrow width and compact height. In this garden it is especially easy to see the design principles of layering – high/med/low plants and the use of color to create a cohesive landscape. Red touches are sprinkled throughout – red twig bark, red barberry plants, red leaves and stalks of swiss chard and beets. Bailey Red Twig dogwood are added to help screen the deer fence, to provide food for wildlife and to provide winter interest with bright red branches that are highlighted after leaf drop. A Pacific Fire Maple also adds fall and winter interest with the beautiful leaf colors and bright red bark. Amazingly we had a red metal trellis donated that is now fitting in perfectly in the Urban Edibles garden. In keeping with the red theme of the garden, several blueberry bushes that display beautiful red fall color were selected for staggered ripening of fruit to extend the harvest period. All are OSU recommended plants.Another good garden design principle – year round interest –Feather Reed Grass shines in all its glory in late summer, but it still very interesting looking in the winter. Join us! We’d love to have you come on Thursdays from 10 am to 1 pm. Come learn, share and enjoy yourself. We have snacks and have a short meeting every week so we can share across disciplines what we are learning each week in the garden.